I started working on the 6 cylinder Bel Air again. It now has it’s old radiator, fan, air cleaner and alternator in place. I want to have it running soon, so I can put some cooling system cleaner in and let it run, to get rid of the rust inside the block. When I got it, you had to wire the coil to the battery to start the car, so it’s pretty clear there’s something wrong. I wanted to have it properly wired before starting it. That’s when I discovered the mess under the dash. 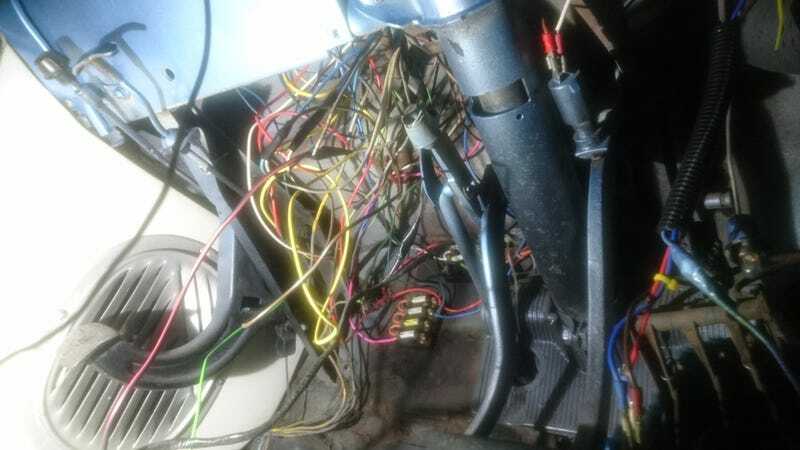 This car has about 40 wires in it, so it shouldn’t be too hard to fix... At least I hope so. Notice what’s wrong with the radiator? I don’t remember how it was attached when I got it. It’s held in place with cable ties now. The new radiator is in the trunk. I’ll replace it when the system is clean.